Known as the "Fairyland on Earth”. 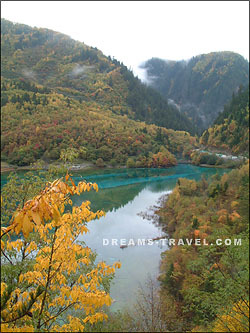 Jiuzhaigou sits on 103°46′―104°4′E and32°15 ′-33°19′N, within the boundary of Jiuzhuigou County, Aba Prefecture, Sichuan. It lies between the southwest margin of the Qinghai-Tibet Plateau and at the north foot of Duo‘erna Mountain Range, with an average altitude between 2,000 and 3,000 meters, and a distance of about 435 kilometers from Chengdu, the capital city of Sichuan Province. 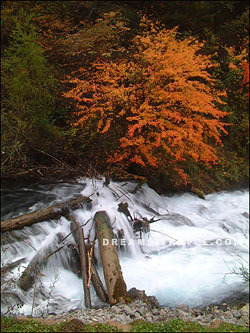 To its east, Jiuzhaigou neighbors both the Baihe River Nature Reserve and the Wanglang Nature Reserve, and to its south is the Huanglong Place of Scenic Interest. 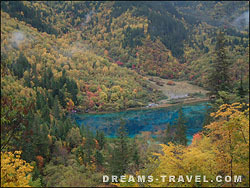 Jiuzhaigou covers a total area of 720 square kilometers, with a periphery zone of 600 sq. m. and a buffer zone of 110sq. 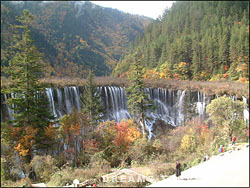 m.
Jiuzhaigou, also called "Yangtong" in ancient times, currently has other names like "Heyao Jiuzhai", and the " Jade Sea ". Jiuzhaigou, literally the Nine Village Valley, is hence known for the nine Tibetan villages within its boundary, that is, Panxin, Rize, Yacuo, Panya, Zechawa, Heijiao, Shuzheng, Heye and Zharu. The area of Jiuzhaigou as well as the upper reaches of the Jialing River and Minjiang River is called the land of Shiqiang (Qiang ethnic minority) in ancient times, where human activities have been recorded dating back as early as to the Yin-Shang Period (16th-11th Century B. C.). According to The Records of Songpan (vol. I - Rivers and Mountains), the "Jade Sea is 50-odd kilometers to the northeast county, within the territory of Zhongyang Tongfan Tribe. Its valleys are as long as several kilometers with green water and jade-like ripples." This evidences that the Jade Sea beauty was well known as far back in ancient times. Jiuzhaigou covers the Shuzheng Valley, Rize Valley and Zechawa Valley that form a "Y" shape, in the Minshan Mountain Range. Inhabited by Tibetans, the nine villages and alpine lakes, affectionately called "Haizi", are like reflecting mirrors or crystal jade blocks inlaid in snow mountains and forests. At the end of Zechawa Valley is the Chang (Long) Lake and the end of Rize Valley are virgin forests. From south to north, both valleys stretch and meet at Nuorilang. The drop between the two valleys and Shuzheng Valley is over 1,000 meters, with 114 lakes lying downward in an echelon manner, on which are 17 waterfalls, 11 rip currents and 5 travertine beaches, formulating alpine lake clusters and travertine spots that are rarely seen in China and even in the world. 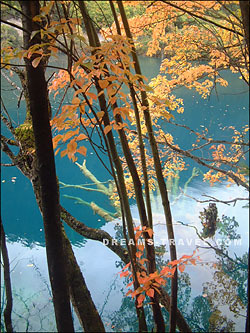 A fairyland on earth, Jiuzhaigou collects the primitive, natural beauties best demonstrated in its lakes, waterfalls, beaches, water currents, snow peaks, virgin forests and Tibetan customs.